When Harry Potter was new, I tried to read the first book. I struggled with how horrible Harry's aunt and uncle were. I put the book down and didn't pick it back up for many many years. I trudged through those beginning pages and found out that there was this incredible story that happens after Harry leaves that horrible home. 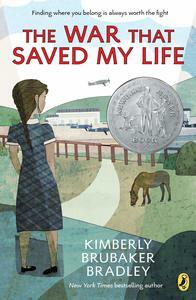 This week, I finally read The War That Saved My Life by Kimberly Brubaker Bradley. It starts in a dark horrible place, which I sort of expected because the book does have "war" in the title. In this historical fiction, we meet Ada and her younger brother Jamie who live in London at the start of World War II. Ada has basically been held prisoner in her mother's flat because she has a club foot. The beginning is dark, and while I found these scenes difficult to read, I couldn't put this book down. Jamie is sent to live outside of London, as many children were to save them should London be bombed. Ada secretly learns to walk while her mother is at work and sneaks out with Jamie to get on the train. They arrive in the country, and although no family initially takes the children in, the woman in charge of the evacuated children finds them a place to live with Susan Smith, a woman who didn't want children. The story has bombs and spies and fighter planes overhead and death, and it has friendship, courage, hope, and a beloved pony. While I loved many things about this book, I was most impressed with Bradley's ability to express the relationships between the characters and the emotion. She conveys the feelings of strong emotions brilliantly. Ada's sheltered existence leaves her with a very limited knowledge of words for every day objects and emotions, and Bradley conveys Ada's feeling effectively. War brought death for many in this book, but it also brought life and family to Ada, Jamie, and Susan. A few weeks ago, I picked up a copy of the second book, The War I Finally Won, and I am already engrossed in book two of this amazing series.